Prick each sweet potato with a sharp knife and bake in the oven for 20 minutes or until they are soft. When your sweet potatoes are ready, take them out of the oven and let cool for 5 minutes so that you can handle them. Carefully cut each sweet potato in half. Using a spoon carefully scrape some of the potato out and place into a bowl. Repeat this until you have finished. Add your milk to the scraped out potato and season with salt and pepper. Mash until it is nice and creamy. Divide the mash between the potato skins. Sprinkle the spring onion and cheese all over. Place back in the oven for 5 minutes until the cheese has melted. 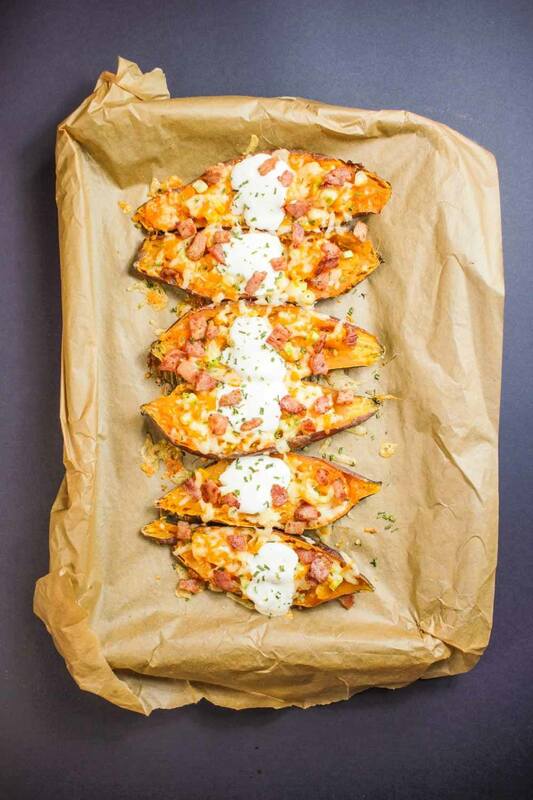 Take your sweet potato boats out of the oven and sprinkle the bacon all over them, then add a dollop of sour cream and finish with chives. Serve and enjoy with extra helpings of sour cream!